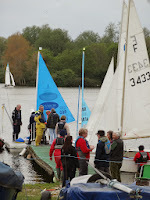 It was quite an encouraging start to the Open Weekend today with nearly 60 visitors taken out on the water for sailing taster sessions; several new members joining and one boat sold! Thanks to all those who helped out. There was a good breeze from the West and it stayed dry but it was pretty chilly. This didn't stop the icecream van doing a fairly steady trade. Tomorrow's taster sessions start again at 10.30 am.